I like a good debate with someone intelligent and not abusive. I had another one in Feb-Mar 2009. The discussion started on email. John gave me permission to put it up here. Expat Yank on this debate: "Wow! Get yourself a cup, and give yourself lots of reading time. But it is time well-spent, because it is an excellent example of what debate on the net really should be." By the way I had a look at your web site. In fact I spent quite a while on it. I see your point on a lot of things, although I don't agree with you I support your right to hold those opinions and speak about them. If you'd asked me ten years ago I would have agreed totally with you on the issue of Israel. However, currently I believe Israel behaves like an abused child that has grown up to become an abuser. As for terrorism, Islamist or otherwise, I think it takes a lot for anyone to resort to terrorism and I think the Palestinians have endured a lot. I think Israel's policy of responding to any attack on their territory with extreme measures, while understandable, is criminal. Luckily Britain did not resort to those tactics when the IRA was engaged in terror campaigns. I also believe Zionism is, ironically, a form of fascism, a view I've held since I was a teen. Your stuff on the bible was priceless. Nearly split my sides laughing. "Around the world, those many millions who hate America and want it to fail are celebrating an Obama win." Totally disagree. I would say: "Around the world, those many millions who love America and remember what America can achieve when it puts its fears aside and remembers what it can be at its best are celebrating an Obama win." We can catch up on politics later, but I've got to go for now. I hope you're right on Obama! As for terrorism, Islamist or otherwise, I think it takes a lot for anyone to resort to terrorism and I think the Palestinians have endured a lot. I am sure that life for Palestinians is hard, living as they are under the wealth-destroying terrorist regimes of Hamas and Fatah, who allow no dissent and no human rights. What causes Palestinians to machine gun babies in car seats is not poverty or oppression. It is religion and ideology. The idea that "poverty" and "oppression" must drive the Palestinians' violence is only one (in my view, simplistic) answer. I suggest on the above page another world view, where the violence is not caused by any rational grievance or logical complaint. As Theodore Dalrymple says: "The idea that if someone is prepared to do something truly horrible, he must have a worthy cause remains attractive to liberal intellectuals"
I think Israel's policy of responding to any attack on their territory with extreme measures, while understandable, is criminal. Luckily Britain did not resort to those tactics when the IRA was engaged in terror campaigns. If Dublin was backing the IRA the comparison would be valid. But Dublin has been fighting the IRA since 1922, and sacrificing hard for it. Almost every single garda and soldier killed on duty in Ireland since 1922 was killed by the IRA or splinter groups (not by criminals). So there is no comparison with Gaza, where the government of Gaza is itself launching missiles at Israel. I also believe Zionism is, ironically, a form of fascism, a view I've held since I was a teen. If Zionism is fascist, then how do you explain the fact that 1 million Israeli Arab Muslims have the vote? Well I hope you're right, but I suspect America's enemies are also pleased (and our enemies too). Ah. I see what you're doing. This is akin to your chatbot. Evoke an emotional response etc. Unless of course you are a chatbot? In which case Mark has succeeded in creating an AI capable of writing all those blogs and fooling people into thinking it's actually Mark. Don't worry Mark help is on the way. I just hope we reach you before it creates an exoskeleton. Unless it already has? No! No AI could talk for 45 minutes about polynomials. I agree Fatah and Hamas are a very bad choice of leadership, but this is what happen in a power vacuum. They may disregard the human rights of Palestinians, but so do the Israelis. 85% of people living in Gaza are refugees from Israel. If Israel was a true democracy it would grant them the right of return. "I million Arabs live in Israel" How many lived there before it was renamed Israel? "What causes Palestinians to machine gun babies in car seats is not poverty or oppression. It is religion and ideology." Agreed, but I think it's poverty, oppression, ignorance (lack of education), religion and ideology. By the way I believe in protecting and promoting Western standards. I just don't believe that killing innocent people will accomplish this. Quite the opposite in fact. Personally I don't believe the findings of the arms trial and I'm still convinced that the Irish government gave support to the provisional IRA. You know, the really difficult thing in all this for me is that I really admire Jewish culture and what it really stands for. You're acting as if my opinions are strange. They may be strange in Ireland, but maybe that means you just need to read more stuff outside Ireland, no? For example, most Israelis would agree with me, including lots who describe themselves as social liberals (secular, pro-gay, etc.). They thought they could make peace in the 1990s, but they got a brutal lesson in the realities of Palestinian thinking. I agree Fatah and Hamas are a very bad choice of leadership, but this is what happen in a power vacuum. Come on, this is a bit naive isn't it! The idea that the brutality of Fatah and Hamas is caused by circumstances? or religious maniacs (Saudi Arabia, Sudan, Iran, the Iraqi resistance, Hamas). The fact is there is hardly any tradition of free speech and peaceful debate in the region, let alone any tradition of democracy. Do you, in your wildest dreams, imagine that such a state would be a parliamentary democracy, with freedom of religion, free speech and freedom of sexuality? Of course it wouldn't, which is why I have no interest in seeing a Palestinian state set up. Who cares if Fatah or Hamas set up some new dictatorship? We already have plenty of those. If the Palestinians were fighting to set up a liberal parliamentary democracy, I would support them. But they aren't, so I don't. They may disregard the human rights of Palestinians, but so do the Israelis. Israel grants full rights to its own people, and even to Arab Muslims living in Israel. Comparing Israel with dictatorships that oppress their own people is absurd. Israel is a free society, and its enemies aren't, and that is why we should all support it. 85% of people living in Gaza are refugees from Israel. If Israel was a true democracy it would grant them the right of return. "I million Arabs live in Israel" How many lived there before it was renamed Israel? I hope you are aware that there were a lot of refugee displacements over the last century. What exactly is the principle you are trying to establish? Why are we so stressed about the Palestinians and not these other cases? Seriously, what is the principle here? I'm curious. Yes many people in the world are poor and oppressed and do not resort to violence. Unlike our ancestors who did resort to a bloody rebellion, followed by an even bloodier civil war, followed by the IRA. but I think the violence was probably a mistake, and unjustified. Having said that, the one thing that saves us is that the Irish were fighting to set up a democracy (and did set one up). The Palestinians aren't, and that is why it is an insult to compare the Irish rebels to the Palestinians. Well Israelis don't believe you. Everyone in 2000-03 told Israel not to fight against the intifada. But Israel did not listen. It assassinated the Palestinian leaders, built a wall, and carried out aggressive street fighting (e.g. Jenin). And lo and behold, the intifada stopped. The West Bank Palestinians hardly kill anyone now. It is wonderful. Israel attacking Gaza will quite likely stop the rocket fire, despite what you say. Making war against them seems to lead to less terrorism, not more. This is in contrast to Ireland, where the peace process led to far less killing, not more. Thinking that the Israel problem is like the Ireland problem is tempting and simplistic, but the evidence suggests otherwise. "You're acting as if my opinions are strange." Not at all. I think your ideas are different from mine, but who wants to live in a world were we all think the same way? You're right. I do need to read more, although nothing I read will ever convince me that what Israel did in Gaza recently was right, or that firing rockets into Israel is right. Revenge is no excuse for murder though, and neither is self-defence. As I said to a Jewish-American friend recently. If a cop is chasing an armed criminal and that criminal takes refuge behind innocent civilians is the cop justified in firing into the crowd of civilians to kill the criminal? I suspect that most people would say no, but yet that's exactly what the IDF did. Fired into crowds of innocent civilians in the vain hope of killing the few terrorists (criminals) hiding amongst them. "The idea that the brutality of Fatah and Hamas is caused by circumstances?" Everything is a result of circumstances. "... Fatah and Hamas are an expression of the normal Arab Middle Eastern political culture - either thuggish strongmen ... or religious maniacs ..." Come on now. That culture is reactionary in nature and I'm not even sure it's a culture. Was the IRA an expression of the normal Irish political culture? No. Of course not. Most of their support was reaction to British oppression and I'm ashamed to say brutality. Fatah and Hamas are a reaction to Israel's oppression and brutality. "Israel grants full rights to its own people, and even to Arab Muslims living in Israel. Israel is a free society, and its enemies aren't, and that is why we should all support it." If the Deutschen Volk had nowhere else to go I'd say there would be a good argument for letting them back into Poland, but I think Germans and others are quite happy where they are. As for Jews going back to Arab countries, I've been to some of them and I think I can guarantee that they would be murdered. No I think Israelis should stay where they are, and all the best to them. I do agree with the recreation of Jewish society in Europe though. Europe lost more than it knows in the Holocaust..
"Why are we so stressed about the Palestinians and not these other cases? Seriously, what is the principle here? I'm curious." In nature it's survival of the fittest, but one of the things that distinguishes us from animals is that we protect the weak and the helpless. We don't prey on them, or at least we shouldn't. These other cases (as you call them) have been resolved. The Palestinian issue has not been resolved. A Jewish friend said to me some time ago that they wished that Palestinians would just live their lives and be happy and leave Israel alone. However, I think that is really difficult for Palestinians. Their society has been decimated and they've been herded like animals into these little enclaves, while their land has been stolen and renamed by immigrants and the children and grandchildren of immigrants. The principle is one of basic justice in my opinion. What about allowing Palestinians to return to Israel? Allowing them to participate in a democracy. "...violence was probably a mistake, and unjustified." Totally agree. "Having said that, the one thing that saves us is that the Irish were fighting to set up a democracy (and did set one up). The Palestinians aren't, and that is why it is an insult to compare the Irish rebels to the Palestinians." The Palestinians think they are fighting for freedom, which I suppose is what the volunteers thought they were fighting for. By the way much of my family were members of the IRA. I'm not insulting their memory by comparing their struggle with another group of oppressed people. I'm trying to strike a chord of empathy. "Israel attacking Gaza will quite likely stop the rocket fire." It didn't stop the rocket fire and it wasn't supposed to. It was an opportunity for Israeli politicians to show how tough they were. Nothing more than an exercise in political bravado. Does the cost in human lives matter? "Making war against them seems to lead to less terrorism, not more." What you're saying here is that killing a thousand people leads to less acts of terrorism which kill few in comparison. "This is in contrast to Ireland, where the peace process led to far less killing, not more. Thinking that the Israel problem is like the Ireland problem is tempting and simplistic, but the evidence suggests otherwise." I don't think the Irish problem is like the Israel problem, but there are parallels. Needless loss of human life being just one. Yes the peace process. Why not try one of those. They usually start with a cease fire, but how can you have a cease fire with a non-state like Gaza? You can't just throw a bunch of people into a tiny enclave, tell them that's it's their home and be surprised when criminal thugs take over. I think I understand why even most liberals in Israel were in favour of action in Gaza. If I saw my home being attacked I'd want revenge too. It's not revenge. It's some way of stopping the attacks. Historically, talk has been useless in stopping such attacks. The recent Gaza operation may or may not succeed. Talk and negotiation certainly won't. If a cop is chasing an armed criminal and that criminal takes refuge behind innocent civilians is the cop justified in firing into the crowd of civilians to kill the criminal? If Hamas are firing rockets from civilian areas, does Israel just have to put up with it? I suspect that most people would say no, but yet that's exactly what the IDF did. Fired into crowds of innocent civilians in the vain hope of killing the few terrorists (criminals) hiding amongst them. Have you watched the IDF videos? When Hamas fighters move into crowds of civilians the attacks are aborted. "... Fatah and Hamas are an expression of the normal Arab Middle Eastern political culture - either thuggish strongmen ... or religious maniacs ..." Come on now. That culture is reactionary in nature and I'm not even sure it's a culture. I don't think you have even remotely a similar world view to me. To me, it is a simple fact that western countries - e.g. in western Europe - have democracy, free speech, freedom of religion and freedom of sexuality. And the Middle East does not, with the sole exception of Israel. Israel is the only country in the Middle East in which you or I could live and be free. If you don't accept this, then no wonder everything else you say about Israel seems incomprehensible to me. We diverge at square one. I believe we should support the Free countries, and oppose the "Not Free" ones. Show me your map of free and unfree countries. And the lack of freedom in the Arab Muslim world is not a "reaction" to Israel or the West. If not, tell me when there were parliamentary democracies, and freedom for gays and atheists, in the Arab Muslim world in the past? Was the IRA an expression of the normal Irish political culture? No. Of course not. Most of their support was reaction to British oppression and I'm ashamed to say brutality. Not true. British "oppression" was real in penal and famine times, but was almost non-existent by 1916. The 1916 rising was an expression of hope, not a reaction to "oppression". And I am no defender of the old IRA, but you are far too hard on them. They were fighting to set up a democracy. When they won, they set one up. This makes them far superior to about 90 percent of all rebels ever. Fatah and Hamas are a reaction to Israel's oppression and brutality. Sorry, I think that is nonsense. Fatah and Hamas are just politics as normal in a culture with no tradition of democracy or human rights. So Israel shut journalists out of a war zone - and that means it does not have a free press?? So when Ireland had Section 31 we were as bad as China?? Come on, this is a bit hysterical, isn't it? "There is no such thing as the "free" world. If a western country has any flaws at all, then it is more or less the same as medieval tribal dictatorships." and those that are not. I go with Freedom House's list. Whose list do you go with? Of course Israel has a free press. It's a western country, like Ireland. And that's why we should support it, and have contempt for its enemies. Why Islamic religious maniacs appeal to secular guys like you is a mystery to me. Why is this population movement so important? Why are you going on about the Palestinians and not the Germans/Jews/Greeks? You haven't really given an answer. and (b) Jews were expelled all over the Middle East, and lost their land and houses, so everybody had it rough. Jews were expelled from all over the Israel region. so that land would have to be given back too, and made into settlements. After 0-5 years, you can reverse a population movement and give everyone their houses back. After 60-80 years it is impossible. and I don't think it's practical to evict several million Israelis from houses and land because it is to revert to the owners of 60 years ago. It's not very realistic is it? In nature it's survival of the fittest, but one of the things that distinguishes us from animals is that we protect the weak and the helpless. We don't prey on them, or at least we shouldn't. These other cases (as you call them) have been resolved. The Palestinian issue has not been resolved. "Weak and helpless" hardly describes prolific and sadistic killers. Sure the Palestinians have a tough life. But they are a deeply unattractive cause. They are just bog-standard tribal religious nuts who want to set up some thug state with no human rights. Good luck to them, but why should we get excited about their cause? Surely there are many far more worthy causes in the world? A Jewish friend said to me some time ago that they wished that Palestinians would just live their lives and be happy and leave Israel alone. However, I think that is really difficult for Palestinians. Their society has been decimated and they've been herded like animals into these little enclaves, while their land has been stolen and renamed by immigrants and the children and grandchildren of immigrants. The principle is one of basic justice in my opinion. Everyone in the world has ancestral grievances they could whine about forever. Your friend is right. The Palestinians should just get on with it. If they tried to build a normal society, they would be very prosperous. Note how the Palestinians were prospering under Israeli "occupation", with a growing economy linked to Israel and Israeli settlements. GDP per capita was (1990 $) 1,790 in 1967, and (1990 $) 5,312 in 1999. That is, the Israeli occupation made the "oppressed" Palestinians 3 times richer. Then Clinton helped the thug Arafat set up a terrorist state, Arafat launched the unprovoked intifada, and the Palestinian economy collapsed. And they didn't even win the intifada, but were soundly defeated. If Palestinians are "poor" today, blame Arafat, Fatah and Hamas, not Israel. I'm not here to defend the Old IRA, but it is wrong (forget the word "insult" if you like) to compare them to the Palestinians. They fought for entirely different ideas of society. Not every "rebel" is fighting for the same idea. That is rather sloppy thinking. And comparing anyone with Palestinian fighters is by definition to insult them, in my opinion. No it didn't. Maybe they need to attack them again. and it wasn't supposed to. It was an opportunity for Israeli politicians to show how tough they were. Nothing more than an exercise in political bravado. So you say. How would you stop the rocket fire? Again, how would you stop the terrorism? Yes the peace process. Why not try one of those. They tried one. It didn't work. Israel won't make that mistake again. The "left-wing" view of the Israel conflict is that there is something Israel/the West can do to bring peace. except implement security and deterrence. I'm afraid the left's ideas were given a trial run in the 1990s, and they didn't work. What makes you ignore the results of that experiment? The bottom line is though: Why should we care about the Palestinians? I care about the people in the world who want human rights and freedom of religion and free speech and elections and so on. The Palestinians don't, so why should I care about their cause? Why do people like you care about these tribal religious nuts? Shouldn't you care about a more worthy cause? btw You should write a blog. You claim that "Historically, talk has been useless in stopping such attacks", yet in Ireland and Britain it's only by talking to the provisional IRA that we have stopped most of the violence. You'll no doubt counter that our situation is different. However, I feel that lack of engagement is at the root core of all terrorist acts. Historically, who has resorted to terrorism? Those in society who feel marginalised. You asked: "If Hamas are firing rockets from civilian areas, does Israel just have to put up with it?" I don't believe they should. I think they should try and engage with those responsible instead of killing innocent people and swelling the ranks of terrorists. Please listen to the comments by John Ging, the Irish U.N. chief in Gaza in this last video. Then listen to the IDF spokesperson accusing Hamas of using civilians as human shields. If we are to accept the Israeli argument then we would have to accept that any civilian is a legitimate target. I don't accept this. Words are more powerful than any bullet. In a previous exchange you described some of my views as being simplistic and now you say that to you it's simple: "Israel is the only country in the Middle East in which you or I could live and be free." what if I were to tell you that my grandfather was a Palestinian that was expelled from Israel in 1947? That would mean that I do not have the right to live and be free in Israel, wouldn't it. If we respect freedom and the right to choose then we have to accept the fact that not all people would choose to live in a Western Liberal Democracy. or religious maniacs (Saudi Arabia, Sudan, Iran, the Iraqi resistance, Hamas)." Syria was under French Mandate until 1946. Egypt was controlled indirectly by Britain through a puppet dictator until 1952. Libya: controlled by an assortment of European countries until 1952. Iran, ruled by a puppet of the West until 1979. The point I'm trying to make is that we Europeans exploited these countries and then pulled out without even attempting to set up any democratic institutions. Are we surprised that gangsters took over in the power vacuum we left behind? I can't explain religious fanatics, including Christian fanatics, but I understand why people find their rhetoric appealing, beacuse they have been offered nothing else. Does that sound like a free press to you? As for your point about it being too late to reverse a population flow, I agree somewhat. Israelis have shown that they can live side-by-side with Arabs. So why not allow Palestinians the right of return? Why not forget about a two state solution and have a one state solution. I read a parable a long time ago about a Jew who married an Arab. It was said that their children were fortunate. These two peoples have struggled for over sixty years and longer. Imagine what they could achieve together. Are you suggesting that all Palestinians are prolific and sadistic killers? Of course you're not. You can't tell me Mark that you don't feel as much sympathy for Palestinian children as you do for Israeli children? By the way when I wrote that: "Their society has been decimated and they've been herded like animals into these little enclaves, while their land has been stolen and renamed by immigrants and the children and grandchildren of immigrants. The principle is one of basic justice in my opinion." I should have written that Palestinians believe their land has been stolen and renamed by immigrants and the children and grandchildren of immigrants. I've just read it again now and I really didn't mean to make such an ignorant remark. If increased GDP was the only goal of people then we would still be part of the Commonwealth. In fact we refused to join it again just recently. Why is that? "Not every "rebel" is fighting for the same idea." True, but it takes a lot for someone to become violent. Do you think Palestinians are born with a rifle in one hand? No. The environment they live in causes some of them to resort to violence. I strongly disagree with you about comparing the IRA to Palestinian fighters. I feel it's a valid comparison. People, are all made of the same basic stuff. There is no terrorist gene. Young Irish men joined the IRA because they felt that Irish people were being marginalised in their own country. Young Palestinians are being indoctrinated into a very similar mind-set. You've asked how I would stop the terrorism. If there is one thing history has taught us it's that you cannot defeat an ideology with a bullet. There were times when nobody believed that the IRA would stop short of a United Ireland. Yet they have stopped. They stopped because their opponents talked to them and engaged with them. That's how I would stop the terrorism. Through rational and open dialogue. "What makes you ignore the results of that experiment?" I don't believe it didn't work. It wasn't perfect, but it brought the prospect of peace a little closer. Perfection is not the goal, just because something isn't perfect doesn't mean you throw it away. Why not try and fix it and improve it. I don't believe the Israelis lack the stamina to keep trying for peace. The bottom line is though: Why should we care about the Palestinians? We should care about Palestinians for the same reason we care about Israelis, because they're human beings. The Palestinians don't, so why should I care about their cause? I don't accept that the Palestinians don't want all these things. Why do people like you care about these tribal religious nuts? I'll refer you to my earlier point. They are human beings. Shouldn't you care about a more worthy cause? Subjective. Wow you are really convinced in your beliefs! You claim that "Historically, talk has been useless in stopping such attacks", yet in Ireland and Britain it's only by talking to the provisional IRA that we have stopped most of the violence. No, you misunderstand what I was saying. I was referring to Palestinian terror only. Yes, talk has been useful in some other places. But not all terrorism is the same. Not all terrorists are fighting for the same things. That is my main point. You'll no doubt counter that our situation is different. However, I feel that lack of engagement is at the root core of all terrorist acts. We'll just have to agree to differ. To me, saying that all terrorism is the same is like saying that all wars are the same. Historically, who has resorted to terrorism? Those in society who feel marginalised. Again, this is a classic myth of the western left, often asserted, but rarely is evidence provided. but all these videos are from the known pro-Islamic-terrorist station Al Jazeera. This is basically enemy TV. Please listen to the comments by John Ging, the Irish U.N. chief in Gaza in this last video. I would trust the IDF over the UN any day. Then listen to the IDF spokesperson accusing Hamas of using civilians as human shields. If we are to accept the Israeli argument then we would have to accept that any civilian is a legitimate target. No, they are not saying this. Otherwise they would ignore Hamas and just try to kill as many Palestinians as possible. You would see 300,000 dead civilians, not 300. The IDF are not saying every civilian is a target. They are saying that if the enemy fires from densely populated civilian areas, they still have a right to try to stop the enemy. but if they do the enemy must be held morally responsible. Many or most Israelis believe that Palestinians deliberately fire from schools, mosques, etc. because they know Israelis will hesitate to reply. Whereas imagine just for one second an Israeli soldier surrounding himself with civilians in the hope that this would deter a Palestinian attack. Of course the Palestinians wouldn't hesistate for a second - they would be delighted to kill the civilians. The tactic of hiding among civilians only works against democracies like Israel. Non-democrats like the Palestinians, Soviets or Nazis would never hesitate. "Israel is the only country in the Middle East in which you or I could live and be free." what if I were to tell you that my grandfather was a Palestinian that was expelled from Israel in 1947? That would mean that I do not have the right to live and be free in Israel, wouldn't it. These rights only exist in Israel in the Middle East. There is no evidence that Palestinians want to set up a state with these rights. You have not provided any such evidence. As I say, why do these gay-killing religious thugs appeal to nice liberal secular people like you? I don't get it. They might be "oppressed" but they don't want to build a society that you or I would admire. You said Israel does not have a free press. I say, ok then, show me your list of countries that are free societies and those that are not. I seriously don't understand your world view. If you think Israel is not a free society, then what else? Do you think Ireland is not a free society? So you support human rights abuses if the majority of the people in a country support them? And they were democracies before the Europeans arrived?? There never was any democratic tradition there. Thug strongmen and religious maniacs are the normal, natural governments of human history (sadly). Fatah and Hamas are normal-type governments in the history of the region. They are not a "reaction" to "oppression" as you claim. I guess the maniac dictators of Africa and the Middle East can go on blaming western "imperialism" for everything for another 50 years. It's all the west's fault. Non-western people could never possibly be stupid and evil themselves. That would be racist. Well that's pretty extremist. Do you apply the same incredibly high standard to all countries? Again, what is your list of countries that do have a free press? Yes it does. Of course every government - from Obama to Cowen - wants to "control the narrative". The question is do they jail journalists and bloggers for dissenting? Show me the journalists in Israeli jails for criticising the government. The modest restrictions Israel put on during the Gaza war (and that are now lifted) are nothing compared with the restrictions on war reporting in Britain in WW2 (and for the same reason - to stop the enemy finding out troop movements etc. during the war). So do you claim that Britain did not have a free press in WW2 - that it was no different to its enemy Nazi Germany on press freedom? All you have to do is read Israeli blogs and media to see that it has a vibrant free press, just like us. Again, I'd love to see your mental map of the world - of which countries have a free press and which don't. As for your point about it being too late to reverse a population flow, I agree somewhat. Israelis have shown that they can live side-by-side with Arabs. So why not allow Palestinians the right of return? A right to be a citizen without the right to recover your great-grandfather's house and land? Maybe. But I would worry for the future of Israeli democracy if you let in a few million people who did not believe in democracy. Of course life is hard for Palestinian children. They are caught up in these awful wars. Their thriving economy was destroyed by Arafat. They are taught to hate in schools rather than taught to better themselves. But their leaders are not "weak and helpless". They are prolific and sadistic killers. Do you mean that increased Palestinian poverty is a good thing? But you assume the cause is "oppression". There are many other possible causes though, such as "religious mania". The "environment" that causes them to be violent might be their school, home and mosque. I strongly disagree with you about comparing the IRA to Palestinian fighters. I feel it's a valid comparison. People, are all made of the same basic stuff. There is no terrorist gene. It's a simple theory, that all terrorism is basically the same. Is KKK terror basically the same as IRA terror then? It works sometimes - as in NI recently. Do you believe talking would have worked with Hitler? I see your memes: "All conflicts are the same. All conflicts can be resolved by talk." I just don't see any evidence that these memes are true. Note that I don't claim the opposite, that "All conflicts must be resolved by violence". I just claim that "Some conflicts can be resolved by talk. Some can't. This is one that can't." "What makes you ignore the results of that experiment?" I don't believe it didn't work. It wasn't perfect, but it brought the prospect of peace a little closer. No it didn't. It made the violence worse, not better. It strikes me that you have an already fixed opinion: "Peace process good" and you are not willing to look at empirical evidence that it may not be true. Don't you get my point? Of course there are decent people who are Palestinians. But their leaders are appalling people pursuing an appalling goal. Why is the Palestinian cause of obsessive interest to western leftists, when there are so many possible causes for them to be interested in? Don't you even understand my disbelief as to why this is an important cause? Send me evidence that a majority of Palestinians want these things. Send me evidence that a Palestinian state will have civil liberties for atheists and gays, and a parliamentary opposition. Actually I'm never fully convinced of anything. I'm always open to the possibility that I'm wrong, as I'm sure you are, or you wouldn't even have any discussion. The one thing I'm am absolutely convinced of is that killing innocent people is wrong. I will never accept the various arguments that sometimes it's unavoidable, or that their own leaders are responsible. Agreed! However, don't terrorists rely on support from some population in general? Can we take away that support, or not create it in the first place. Actually I've rethought this. Not all terrorists have suffered some injustice. I'm thinking of Binladen and some of the European and American groups. However, the causes they claim to support and defend generally do result from some injustice. O.K. I accept that this was a generalization on my part and that's never a good thing. Actually I don't agree that this station is pro terrorist. I watch it quite a lot as I do Fox (but Fox News is just for the hilarity of their reports). The reason I used their coverage is quite simply that they were the only news organization in Gaza at the beginning and they weren't restricted by IDF censorship. Look at the people speaking. Is John Ging a terrorist? Wasn't Israel created by a U.N. resolution? You are using the word Palestinian as if it meant terrorist. Hamas are morally responsible. However, that does not negate Israel's responsibility to protect civilians, both morally and under international law. Not only did they fail protect civilians, but there is significant evidence that they deliberately targeted civilians. Who says I'm a liberal? I'm very conservative in my views on taxation, abortion etc. I reject your consistent attempts to label me. No one should be murdered for their sexuality and we should be insisting that the Palestinians respect human rights. That does not negate their human rights. Even prisoners on death row in the U.S. have their human rights respected, no matter how heinous the crime. Again you are trying to tar all Palestinians with the same brush. Would you say that all Irish people are ultra right wing religious nuts? No, but some are. By the same token not all Palestinians support restricting sexual freedom. I apologize for this map. I wasn't making fun of your opinions Mark. I was illustrate that we all live on the same planet. No country is perfect. Some people in Ireland could be treated better. Travellers, for example. No. That's not what I'm saying. What I'm saying is that there are some people who would choose to live in an Islamic republic Does an Islamic republic mean human rights abuse? Probably. Do you stop those abuses by going to war? I don't think so. Look what happened to Turing in Britain just over fifty years ago. His human rights were abused terribly as a result of some backward notions on decency. However, Britain changed to respect the human rights of homosexuals. Iran is an Islamic republic due to a popular revolution. Its people can change what type of state they want to live in. Most of the Europeans weren't democracies when they arrived in these countries! Britain for example! Well that's pretty extremist. Do you apply the same incredibly high standard to all countries? Yes! Applying high standards doesn't mean that we will always live up to them, but we should always try. Britain was fighting the most powerful and advanced country in the world during WWII. Compare this to Gaza. Palestinians and Arabs live in democracies all over the world. Are they in danger? Then why didn't you write that their leaders are sadistic killers? At present European leaders are promising to give millions to the reconstruction of Gaza. Why aren't they attempting to put conditions on this aid? Open and free elections. Stop firing rockets at Israel. And when I say why aren't they I mean why aren't we. What I mean is that people don't just equate freedom with wealth. I accept that there are many other causes, but that doesn't mean we have to give them any more reasons to hate the West. And I include Israel in the West. I'm not saying that all terrorism is basically the same, but I am saying that there are some very basic similarities in the backgrounds of some people who join terrorist groups. Nazism was not defeated with a bullet! Germany was. Nazism was defeated with the Marshall Plan. And stop looking at my memes! Just kidding. :) These are not my memes as you put it. All conflict is not the same, but I believe that conflict can be resolved through dialogue. Not all conflict mind you. That would mean Hitler could have been stopped with dialogue, and I don't believe he could have been. The day my opinion becomes fixed is the day I'm six feet under. Actually I want to be placed on a long boat and have flaming arrows fired at my corpse. Let everyone know will you. Let me get this straight. It's O.K. to kill hundreds of innocent people if that means it safe guards the security of others? Is that what you are saying? If so then I don't agree. You equate the violence perpetrated against Israel with all Palestinians, even children. The fact is that this violence is committed by a small number of Palestinians. I agree that Palestinians should take action against these terrorists, but take my word for it. It's really hard to stand up to a guy with a gun to your head, especially if you're a child. Don't you get my point. The vast majority of Palestinians are ordinary decent people trying to get on with their lives. They didn't choose the people in power in Gaza. Since when does the value of a persons life depend on their ability to demonstrate these things? Are you suggesting that if someone isn't a democrat that they can be killed? Actually I'm never fully convinced of anything. I'm always open to the possibility that I'm wrong, as I'm sure you are, or you wouldn't even have any discussion. The one thing I'm absolutely convinced of is that killing innocent people is wrong. I will never accept the various arguments that sometimes it's unavoidable, or that their own leaders are responsible. Well you're putting up quite a fight! Sorry for describing you as liberal or left! Would you say you are from the anti-Israel right? Killing innocent people is wrong. Only one side in the Israel-Palestinian conflict wants to kill innocent people. I'll get back to you on your points when I get time. Anti-Israel? What makes you think I'm anti-Israel. I was against the Iraq war from the beginning. Does that make me anti-American? I'm opposed to the persecution of homosexuals. Does that make me anti-Catholic? No it does not. It just makes me opposed to certain things these groups do. I'm opposed to certain policies of Israel. That is not to say that I'm anti-Israel. I'd like to see Israel living in peace, and unfortunately that's not entirely within their control. The problem I have is that some of their policies seem to play right into the hands of Hamas and their like. The recent attack on Gaza, apart from killing hundreds of innocent people, also caused a world-wide wave of anti-Israel sentiment and that is not in Israel's interest. Only one side in the Israel-Palestinian conflict wants to kill innocent people. Since when has "I didn't mean it!" been a plausible defence in any court? Again to use the cop analogy. A cop fires into a crowd of unarmed civilians because there is an armed criminal behind them. Which plea should that cop enter? A. I'm innocent. I didn't mean to kill them. B. I'm innocent. It was the criminals fault. C. I'm innocent. I had a violent upbringing. D. I'm guilty of murdering innocent people. I saw them there and I still fired. Actually I don't agree that this station is pro terrorist. I watch it quite a lot as I do Fox (but Fox News is just for the hilarity of their reports). And yet Fox News is the one you slag off? Doesn't it bother you that Al Jazeera comes from a country - Qatar - where there is no democracy and human rights? The reason I used their coverage is quite simply that they were the only news organization in Gaza at the beginning and they weren't restricted by IDF censorship. Look at the people speaking. Is John Ging a terrorist? No, but the UN is not an honest broker. How could it be, given the regimes that are members? I'm just pointing out that your sources (UN, Al Jazeera) are tainted by their links with and support for non-democracies. Israel says they don't target civilians, and I believe them, and you said earlier you probably do too, though now you seem to say you don't. The reason I believe them is partly because I am familiar with the culture the Israeli military comes from, because it is my culture too - the western, universalist culture where we do not (any more) believe in targeting innocents in war. Most fighters in history (e.g. all of Israel's enemies) are not from this culture, and I believe all of them do target civilians, which you probably believe too. Give me the worst example since 1960 in which Israel (in your opinion) deliberately tried to kill civilians. I'd be interested to know what you have in mind. Who says I'm a liberal? I'm very conservative in my views on taxation, abortion etc. I reject your consistent attempts to label me. No one should be murdered for their sexuality and we should be insisting that the Palestinians respect human rights. Well you don't seem very worked up about it. I said that Israel was the only country in the region that was truly a free society. Do you think freedom of religion and sexuality really exists in the PA? That does not negate their human rights. Even prisoners on death row in the U.S. have their human rights respected, no matter how heinous the crime. Again you are trying to tar all Palestinians with the same brush. Would you say that all Irish people are ultra right wing religious nuts? No, but some are. By the same token not all Palestinians support restricting sexual freedom. I said Israel is a free society and the PA is not, and that's the major reason I support Israel. Don't you understand why I might feel this way? I support all democracies against their enemies - whether Israel, South Korea, or anywhere else. I'm not sure how you make your decisions. You seem unbothered by whether the countries in a conflict are democracies or not. No one says "free" means "perfect". So because "every country has flaws", Ireland is the same as the PA is the same as North Korea? You don't see democracy and human rights as at all important? Is the philosophy of "Stand with democracies. Stand against non-democracies" really that alien to you? No. That's not what I'm saying. ?what I'm saying is that there are some people who would choose to live in an Islamic republic Does an Islamic republic mean human rights abuse? Probably. Do you stop those abuses by going to war? I don't think so. No one says you have to war against all tyrannies. But just being vocally opposed to them would be a start. That's what seems to me to be missing in your world view. The reason I left the left was because, it seemed to me, they were soft on dictators. I like the neo-con right because they hate all dictators, which to me is the logical starting point for any geopolitical world view. Iran is an Islamic republic due to a popular revolution. No it isn't. The regime was never elected. Its people can change what type of state they want to live in. No they can't. They have no vote. Not sure what you mean. Britain has been more or less a democracy since the early 19th century. Anyway, you are dodging the main point which is that these countries were never democracies. They are ruled by thugs and religious nuts because .. that is what they have always been ruled by. You claimed it was a reaction to "oppression". - especially the PA - with maybe 0.01 percent left for complaints about Israel. and Iran and Cuba and China and ...) and this is your one thread about Israel. Why do Israel's minor restrictions on the media seem to annoy you more than all these other countries' massive restrictions on the media? The short answer: Maybe. Let's hope not. If they (the 57 percent) had the numbers, my freedom and your freedom (and the freedom of liberal Irish Muslims) would end. That's not racist. That's just a fact. Do you dispute that? but it would be foolish to say it will never happen. Worse things have happened in history. It would also be terrible for the millions of Muslims who have moved to the West precisely to escape sharia. Are you familiar with these polls? Well maybe we're not that different. You just think this conflict can be solved through dialogue. I think Israel tried that in the 1990s and it was proved conclusively that it made things worse. And how did the violence end (or at least massively reduce)? Ariel Sharon didn't win Israel's great victory over the West Bank intifada by dialogue did he? He stopped the intifada by security and military means, much against the advice of people like you, I must point out. But it worked. The intifada stopped. The West Bank is now relatively peaceful. Israel doesn't want to kill anyone except Palestinian terrorists. Killing civilians gets Israeli military people nothing good - demotions, abuse from superiors, abuse from the press, abuse from politicians, abuse from foreign allies, and even legal charges. And it sure doesn't make them feel good (because they come from the same culture as you do). Every member of the Israeli military tries to avoid it. In the cockpit, Jerusalem Post, July 18, 2006 - An F-16 pilot in the Israeli Air Force talks about bombing Hezbollah in Lebanon. "Major E, my formation leader walks into the briefing room ... He is concerned about making mistakes, and bombing the wrong targets. He is experienced, and has been around long enough to see mistakes happen and innocent civilians killed. A friend of his, a helicopter pilot once mistook a letter in a target's name, and ended up shooting at the wrong target, killing a whole family. Major E does not want the same thing to happen to us. He emphasizes that there is no rush, that we must check and recheck every coordinate we receive, make sure we understand EXACTLY what we are supposed to target." "It's strange how the focus in these missions is not to succeed, hit the target precisely, but rather - not to make any mistakes. The message is clear all the way from the Squadron commander to the last pilot. One mistake can jeopardize the whole war, like in Kfar-Kana, in one of the last operations in Lebanon, where artillery bombarded a refugee camp, killing over 100 people, which resulted in international pressure that halted the operation. Hitting the target is expected, no misses are acceptable. There aren't any congratulations for a well-performed mission. Only a hammer on the head if something goes wrong. Personally, I think it's a healthy attitude; it causes the whole system to be less rash and hot on the trigger." But it's hard to kill Palestinian terrorists without some civilians dying, especially because of the way they fight. I suggest that if you or I were in charge of the Israeli military, charged with stopping Palestinian terrorists, we would kill more civilians, not less. I wish there was a simple solution to Palestinian violence, such as "talk", and "Israel stop all military actions". There are lots of worthy causes round the world. Why is this one so interesting? Since when does the value of a persons life depend on their ability to demonstrate these things? So you admit I'm right, that a Palestinian state will be a tyranny? Are you suggesting that if someone isn't a democrat that they can be killed? Well there are plenty of non-democrats in the world who should be killed. But war doesn't have to be the answer to all of them. The core of any "ethical" foreign policy should be that we shouldn't support non-democrats, and we should support democrats. I guess that's why I am a neo-con and not a leftist! Let me get this straight. It's O.K. to kill hundreds of innocent people if that means it safe guards the security of others? Is that what you are saying? If so then I don't agree. Obviously it is never ok to target civilians. We agree on that. As to what the precise rules of engagement should be when fighting an armed enemy in civilian areas I have no easy answers. These are tough moral issues I agree. But they require a serious moral answer - rather than just saying that any civilian death is a crime. It is often forgotten that the allies killed thousands of French civilians as they liberated France in 1944. They defeated the German armies, but at great cost to French civilians caught in the fighting. but surely you do not argue that they intended to kill French people? Hamas is at war with Israel, and Israel has a right to strike back. Whether its rules of engagement should be different I don't know. But I do know they don't want to kill any Palestinian civilians, and they try hard not to. I also know that Hamas are delighted when they do (since it furthers Hamas' cause internationally), and Hamas try hard to make it happen. You equate the violence perpetrated against Israel with all Palestinians, even children. I never said this. I don't know what you mean. O.K. We both agree that it is never acceptable to target civilians. My point is this. I don't believe that the IDF do not intentionally target civilians. There are too many examples of needless civilian deaths. When Israel began its offensive against Gaza if it had wanted to avoid civilian casualties then why didn't it allow humanitarian organisations to evacuate women and children from the area, instead of just the ones with foreign passports? Even if they had only let the children out they would have reduced the civilian casualties by one third. And I agree that Hamas are delighted when there are innocent casualties, which makes it all the more tragic when the IDF oblige. Get back to you on your earlier email soon. I said earlier that I didn't agree that Al Jazeera is pro terrorist. Well I've watched the link you sent from their Arabic channel, and I agree that the report is sickening. I have never seen anything like this on Al Jazeera English and I watch it quite a lot. However, I will continue to censor what I watch from all news channels. There is absolutely no excuse for murder and to treat this guy like some kind of hero is disgusting. However, you are getting away from the point.What terrorists do is wrong. What Israel did in Gaza was wrong, and two wrongs do not make a right. You asked "Doesn't it bother you that Al Jazeera broadcasts from a country - Qatar - where there is no democracy and human rights?" Doesn't it bother you that Qatar is a key American ally in the region? And Qatar is relatively progressive compared to some American allies in the region, Saudi Arabia for example. Qatar allows women to drive, Saudi Arabia doesn't. We could talk for hours on human rights abuses in Saudi Arabia and yet it's a key American ally in the region. Are you saying that it's O.K. to ignore human rights abuses when it benefits us? If you are not then you must condemn America and Israel. While both countries seem to respect the human rights of their own citizens America supports regimes that do not and Israel ignores the basic human rights of ordinary Palestinians. You claim that the "UN is not an honest broker." Well I really don't understand what you mean. Are you trying to say that John Ging was lying when he said that Israel had no justification for firing on a UN facility, or when he claims that civilians are not being protected? You also say: "How could it be, given the regimes that are members? I'm just pointing out that your sources (UN, Al Jazeera) are tainted by their links with and support for non-democracies." Does this mean that America is tainted by its links with non-democracies like Qatar and Saudi Arabia? Is George Bush tainted by his close relationship to the Bin Ladens? Ireland is also a member of the UN and its defence forces have in the past, and continue, to serve as peace keepers under the UN flag. A fact that I'm extremely proud of. On the point about Israel deliberately targeting civilians. Let me clarify what I believe. I believe that nearly 1000 people died in the Israeli attacks on Gaza recently. I believe that around one third of them were children. Children! Now let me ask you a question. If Israel actually wanted to avoid innocent casualties why didn't it offer to evacuate the children from Gaza or let others do so, instead of deliberately preventing people from leaving the war zone? In a densely populated area where roughly half of the 1.4 million inhabitants are children (under 14 years old)(http://www.savethechildren.org/emergencies/middle-east-crisis/gaza-conlfict/gaza-emergency-factsheet.html ) didn't anyone think that the risk of killing innocent children was too high? Shimon Peres said after the attacks that: "Palestinian children die because Palestinians don't look after their children." This is a man for whom I had a lot of respect at one time, but no longer. This man and his views do not represent my culture. My culture sends its young men and women to areas of the world to keep the peace. Young men who have been deliberately fired on and killed on more than one occasion by the Israeli Defence Forces. Or, perhaps Israel had some excuse for firing on those UN positions also? You asked for the worst example of Israel deliberately trying to kill civilians since 1960. Frankly, I'm not qualified to judge. However, there is ample evidence that at times there has been deliberate killing of unarmed civilians by the IDF. You wrote that I don't seem very worked up about the persecution of homosexuals in Arab countries. Well I am. I've actually written to several of those governments in the past on that issue and on the issue of the mistreatment of women. I should put it on-line though. Those issues, while important, are not what we are discussing here. We're discussing Israel's misconduct in Gaza. The fact is that nearly three hundred children have been murdered. Three hundred! Those children did not persecute anyone! You wrote: "You seem unbothered by whether the countries in a conflict are democracies or not." I refuse to blindly back a democracy no matter what it does. "Is the philosophy of "Stand with democracies. Stand against non-democracies" really that alien to you?" Yes, because I don't have a vote in Israel so I'm not responsible for its actions and I refuse to defend those actions. However, I will continue to condemn the actions of Hamas and those of Israel when they are patently wrong. "No one says you have to war against all tyrannies. But just being vocally opposed to them would be a start. That's what seems to me to be missing in your world view." I am vocally opposed to tyrannies. I don't do enough though. Just posting articles written by others on my facebook page isn't good enough, I agree. You claim that: "Britain has been more or less a democracy since the early 19th century." However, Britain did not become a democracy until the introduction of adult female suffrage in 1918. Even then, women had to be over 30 to vote. The fact is that when Britain started to leave most of its colonies in the 1940's it had only started out as a democracy itself. So we don't have a very long tradition of democracy in Europe either. That's my point. So when you say that they have no tradition of democracy in the Middle-East, I ask, so what? We've only just started being democracies ourselves. You claim: "They are ruled by thugs and religious nuts because .. that is what they have always been ruled by. You claimed it was a reaction to "oppression". " I'm saying that Palestinians are not ruled by thugs. Hamas are thugs, but they in no way could be considered the legitimate leaders of the Palestinian people. You wrote that "If you are so extreme in favour of free speech, you should have 99.99 percent of your outrage reserved for countries other than Israel - especially the PA - with maybe 0.01 percent left for complaints about Israel." Well I disagree. The PA isn't claiming to be an open free democracy, Israel is. So if Israel is so open and free then let people with legitimate claims to live there do so, instead of herding them like cattle into scrub land. You asked "Why do Israel's minor restrictions on the media seem to annoy you more than all these other countries' massive restrictions on the media?" Simply, because in a free and open society there should be no restrictions on the media and free speech. A point you have argued yourself and one with which I agree. You asked if I was worried that Ireland might become an Islamic state. The answer is NO, not in the slightest. You claim that dialogue with the Palestinians is pointless. I don't believe that you really believe this Mark. You believe in the power of speech. I know you do. It's this contradiction in what you are writing that I can't accept. You asked "So you admit I'm right, that a Palestinian state will be a tyranny?" No. What I'm saying is that because a person is not a democrat does not mean their life has no value and they can be killed. "Well there are plenty of non-democrats in the world who should be killed. I guess that's why I am a neo-con and not a leftist!" I don't want to see anyone killed. Brought to justice? Yes! Harry Truman said that you don't make peace by starting a war and I agree with him. I agree that the core of any "ethical" foreign policy should be that we shouldn't support non-democrats, and we should support democrats. So why did the neo-cons in the Bush administration support Saudi Arabia, Qatar and all those other non-democrats. You describe yourself as a neo-con and not a leftist. Well I'm neither and on any particular issue I could agree or disagree with either camp. I'm complex that way, but isn't that the great thing about not categorising ones self, I don't have to support the ridiculous decisions made by either group if I choose not to. Sorry for the long delay. I had a lot of other stuff on. You asked "Doesn't it bother you that Al Jazeera broadcasts from a country - Qatar - where there is no democracy and human rights?" Doesn't it bother you that Qatar is a key American ally in the region? rather than a traditional conservative (who is happy to ally with dictators in the west's interests). "My idea of an ethical foreign policy is to only ever be allies with free countries. But I do have sympathy for the politicians, who are often faced with horrible choices. I accept that to defend the west without any alliances with unfree regimes often seems impossible. Unfree regimes (notably Pakistan and Kuwait) were essential to the wars on Afghanistan and Iraq, for example. Should their help have been rejected? I accept that it is easier to be an idealist than a politician." I think American "allies" Pakistan, Egypt and Saudi Arabia could just as easily be described as America's enemies. 1. You're the one promoting a TV station from Qatar as some voice of truth. I don't promote anything at all by any of the world's dictatorships. At best I regard them as sleazy criminals who might be of use today in a larger fight, but will just as easily turn on us tomorrow. The billions sent since the 1990s and still being sent today from Ireland, the EU and the US to the Palestinians. And Qatar is relatively progressive compared to some American allies in the region, Saudi Arabia for example. Qatar allows women to drive, Saudi Arabia doesn't. We could talk for hours on human rights abuses in Saudi Arabia and yet it's a key American ally in the region. Are you saying that it's O.K. to ignore human rights abuses when it benefits us? No, I would support any democrat fighting against the vile Saudi regime. Allying with Saudi Arabia is a stain on America's history. If Obama had the guts to change that, he would really change my opinion of him for the better. What are the chances he will? And if not, why not? I'm just reacting the way you would if I said "Fox News said such and such". In your world view the UN has credibility. In mine it doesn't. It depends what's being said. Whenever Bush said something like "Saudi Arabia stands with us against terror, and is a loyal friend" then yes he was tainted and was talking rubbish. Bush was an often confusing mix of idealistic neo-con (Israel, Iraq, Afghanistan) and sleazy traditional conservative (Saudi Arabia, Pakistan). He understood Bin Laden and Arafat instinctively, but he never saw that Saudi Arabia was the enemy too. just having some realpolitik business relationship with a tyranny (the US). I'd prefer to see them in NATO. Some UN missions may turn out to be good works, some may be harmful. But the idea of "obeying" orders from the UN is inherently corrupt. Ireland should not give such credibility to the decisions of Russia, China, and a load of Islamic, communist and African dictators. I think that's a reasonable point. Maybe something like that should be tried. Get Hamas to meet Israel on the field of battle. The logistics seem impossible though. How could children leave without their mothers? And if women were allowed out into Israel, Israel would be hit by attacks carried out by many of those women. So I'm not sure how it could work. Shimon Peres said after the attacks that: "Palestinian children die because Palestinians don't look after their children." This is a man for whom I had a lot of respect at one time, but no longer. This man and his views do not represent my culture. Well it is true that Palestinians have a culture of death and martyrdom, where they tell children the most glorious thing is to die a martyr, and encourage them to go out and fight the Jews, no matter how young and unarmed they are. Western societies (like ours, and Israel) leave fighting to the adult professionals. Let's Talk About the Children by Naomi Ragen - "I cannot help but gasp every time I see it: children in front of tanks, throwing stones at armed soldiers. And nowhere, but nowhere, is there a single mother running to grab their hands and lead them home. Where are the Palestinian mothers? And what in Heaven's name are they thinking when they let their children endanger their lives, and the lives of others"
My culture sends its young men and women to areas of the world to keep the peace. Young men who have been deliberately fired on and killed on more than one occasion by the Israeli Defence Forces. Or, perhaps Israel had some excuse for firing on those UN positions also? I don't know enough about UN - IDF clashes in the past to comment. I do know that I have a great distrust of the UN in any such clash, since the IDF is the army of a democracy, and the UN forces are not. as opposed to small-scale incidents carried out by criminal or incompetent soldiers. No one would dispute that the entire Hamas command has the intent of killing civilians. I fail to see the same philosophy embedded throughout the IDF. Their philosophy seems western to me. You wrote that I don't seem very worked up about the persecution of homosexuals in Arab countries. Well I am. I've actually written to several of those governments in the past on that issue and on the issue of the mistreatment of women. I should put it on-line though. Those issues, while important, are not what we are discussing here. They are relevant because I wondered why the Palestinian cause is so important to you, when their political and religious leaders hate and persecute gays, atheists and liberated women. The Palestinian culture is deeply unappealing, and any state they would set up would be a tyranny with no human rights (which the west would ignore). We're discussing Israel's misconduct in Gaza. The fact is that nearly three hundred children have been murdered. Three hundred! Those children did not persecute anyone! "Murdered" suggests that the IDF was interested in bringing about their deaths. I fail to see how their deaths are in the interest of the IDF. The IDF were not trying to kill them. The IDF were trying to do something else. You might argue that the IDF should have fought a very different type of war, or no war at all, and that would be reasonable criticism. But to argue that the IDF wanted civilians dead is not very believable. that should logically be a call for a cleaner fight, not for no fight at all, or even (god forbid) to support its enemies and hope they win. One can more-or-less support the Allies in WW2 without supporting Dresden. You claim that Iran didn't become an Islamic republic through a popular revolution. Well Iranians overwhelmingly supported the formation of an Islamic republic in a referendum. So your assertion is clearly wrong. See http://en.wikipedia.org/wiki/Iranian_Revolution. There was a referendum in 1979, but it was unclear what the people were voting for. Once they realised the nature of the regime that was being set up, they never got another vote. Oh, come on. These are not elections. An election is something in which anyone can stand without fear, and can criticise the government without being arrested or shot. Iran has not had an election since 1979. When Is an Election Not an Election? - Michael Ledeen, June 16, 2005, on the Iranian "elections" of June 2005: "It's symptomatic of the failure of strategic vision from which our chatterers and leaders currently suffer, that so many words and so much energy are being wasted on the immense charade that goes under the name of Iranian "elections." Any normal person familiar with the Islamic republic knows that these are not elections at all, and for extras have nothing to do with the future of the Iranian nation. They are a mise en scene, an entertainment, a comic opera staged for our benefit. The purpose of the charade, pure and simple, is to deter us from supporting the forces of democratic revolution in Iran." Release of any news about popular boycotts of elections, decreased popular participation in elections, publication of logos of proponents of boycott of the elections (counter revolutionary propaganda) and providing a link to such materials. Release of insulting materials with regard to the elections and candidates. Character assassination of the candidates, personalities and movements related to the elections. Release of the names and reasons behind disqualification of candidates without their written permission. Disclosing the number of voters and release of information about complaints and name of those against whom there are complaints filed before the legal process. Release of announcement of illegal groups and publication of counter revolutionary comments about the elections. Disclosure of the opinions of personalities of the regime without their permission and consent. Use of publicly-owned servers and internet sites to propagate on behalf of certain candidates. 2009 Iranian election protests - The Iranian people struggle for their freedom. After violently suppressing the protests, the Iranian regime issues a directive, Sept 2009, banning all newspapers from publishing any further articles about the disputed election. The newspapers are now banned from even mentioning the defeated candidates Mir-Hossein Mousavi and Mehdi Karoubi. You claim that: "Britain has been more or less a democracy since the early 19th century." However, Britain did not become a democracy until the introduction of adult female suffrage in 1918. Even then, women had to be over 30 to vote. The fact is that when Britain started to leave most of its colonies in the 1940's it had only started out as a democracy itself. And things just kept getting better after that. Britain in 1840 (let alone 1940) was far more of a democracy than Cuba, China, Russia, the PA, Dubai, Qatar or Iran is today. Of course things were worse in Ireland until the later 19th century, and one should ideally want all adults (including women) to have the vote, but to describe Britain as a non-democracy before women had the vote is, I think, to abuse language out of all meaning. You might as well say that Ireland was a tyranny before 1993 when homosexuality was legalised. I simply do not recognise the definitions of language you are using. This is very much related to your stand on Israel. To you, the (inevitable) flaws of the free countries is enough to prevent you standing with those countries against their (genuinely) totalitarian enemies. You're just lucky not everyone in the West feels the same as you, otherwise not a single soldier would ever volunteer to defend the West. So we don't have a very long tradition of democracy in Europe either. That's my point. So when you say that they have no tradition of democracy in the Middle-East, I ask, so what? We've only just started being democracies ourselves. Try criticising the government in 1909 UK or USA as opposed to 2009 Arab Middle East, and you'll see the difference. The Arab Middle East is at least 300 years behind us. Some parts are more like 600 years behind us. You wrote that "If you are so extreme in favour of free speech, you should have 99.99 percent of your outrage reserved for countries other than Israel - especially the PA - with maybe 0.01 percent left for complaints about Israel." Well I disagree. The PA isn't claiming to be an open free democracy, Israel is. Yes, it is a very common practice to criticise the minor flaws of free countries more than the major flaws of unfree ones. I don't agree this is a good idea. I think the major effect of this practice is to let the unfree countries off the hook. Criticising the minor flaws of democrats more than the major flaws of tyrants is exactly what the tyrants of the world want you to do. Law No.1 (The Paradox of the Fisks): The most criticised societies in the world will be the least criminal societies. Sure, but that does not mean we should be comparing Israel's largely free media to those of genuinely closed societies, such as the PA or Iran. Well it's a depressing thought, I agree. I think Israel simply has to wait for new Palestinian leadership to emerge. There's not much Israel can do on its own until that happens. Until then, it simply has to look out for its own security. You yourself agreed dialogue is pointless with some groups (Hitler). Why not accept I think this is another one of those situations? I wouldn't say that was the neo-cons. All the neo-cons hate Saudi Arabia. That was the traditional "realist" conservatives, like Colin Powell, Robert Gates, Bush senior, James Baker and Brent Scowcroft. Bush junior, Rumsfeld and Rice are not really neocons, but a mix of part neocon, part realist. If Obama would break with Saudi Arabia he would really get in my good books. What's his excuse for carrying on this sleazy relationship? Obama bows to the disgusting dictator of Saudi Arabia, Apr 2009, at G-20 summit. Yes, Bush did this kind of pandering to an unelected tyrant also. It's sad to see Obama continuing with the same stuff. A long line of world figures shake hands with the Emperor of Japan. 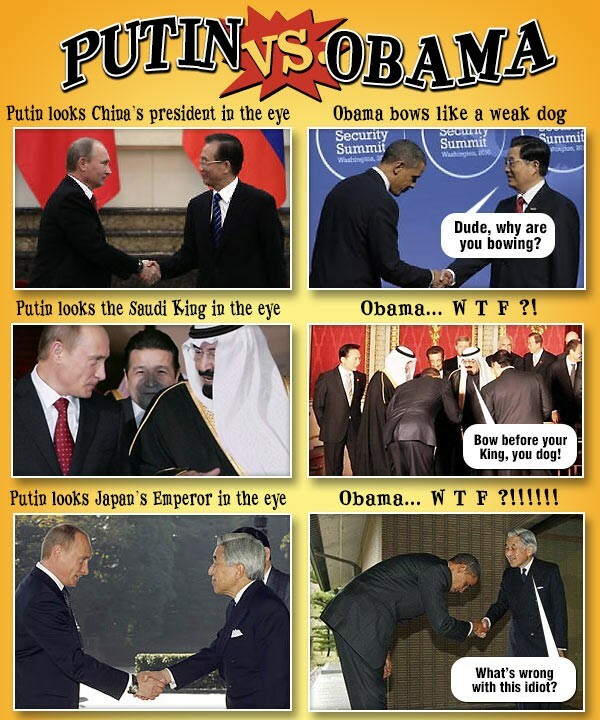 Obama bows. The Emperor of Japan, Akihito, is a mere figurehead in a proper democracy, but his father Hirohito was the powerful Emperor of the brutal tyranny of Axis Japan, which killed 6 million people in democide. Hirohito could have stopped the democide but didn't. Treating this royal family with such respect seems therefore inappropriate. "Bow before your King, you dog!"